Light painting is an `in camera’ photographic technique in which images are created within a single, long exposure, using light sources to `paint’ a picture with light. A more specific way to include light forms within a photo is with `light stencils’. 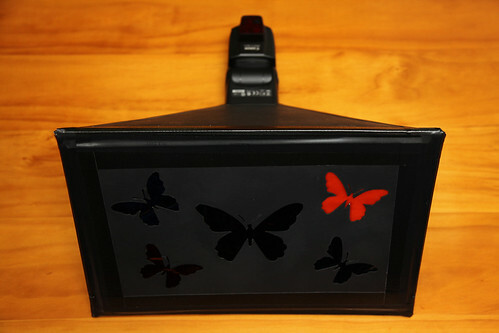 This allows the photographer to `stamp’ that image within a shot using light. There are three main components to light stencilling – the stencil itself, and the lightbox which you attach it to, and the light source that you use inside the lightbox to capture that image. • The printed method. This is where an image is printed out on a black background. It is then attached to the front of a lightbox, which will allow you to stamp that design within your shot when a light source is flashed behind the stencil image. The downfall to this method is that you need to print multiple layers of the same image to provide a good depth of colour and clarity. Lining up the multiple pages is pivotal to the stencil image appearing correctly in the final shot. Lastly, most shots using this method appear quite faded and washed out, and look like they have been shot through photocopy paper. • Another method is to cut the image out of cardboard, and then create the detail and colour yourself. This takes a bit more time and patience, but allows for greater flexibility for you to create the right colour and depth that you want to achieve for that shot. For this tutorial I will be using this method. The lightbox is what the light stencil is mounted onto. This contains and directs the light directly behind the stencil image, to allow it to be stamped within the shot. 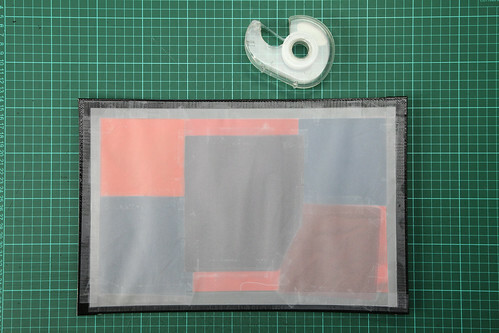 Again, there are many methods for making the lightbox. For this tutorial I will use a shoebox (and have also included a link to a collapsible lightbox, should you choose to make one). 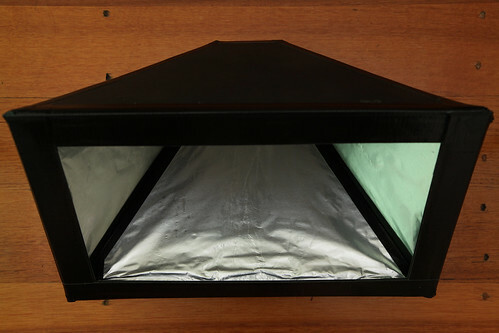 I use a flash unit inserted into the back of the lightbox. This is then test fired to highlight the stencil image. You don’t need an expensive or fancy flash unit to do this. The aim is for a quick burst of light (ie your stencil will appear as a blur of dragging light if the light source does not flash quick enough). 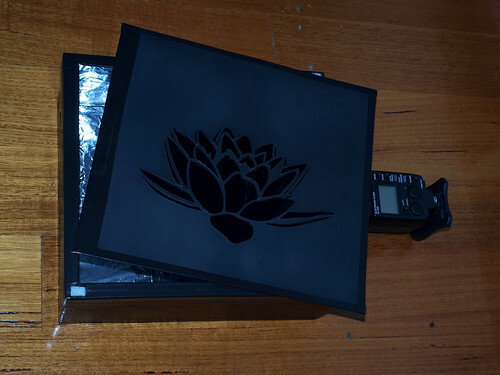 A compact camera flash shot off works when flashed inside the box, as does a torch (but you would need to keep the stencil and box completely still for this to work). 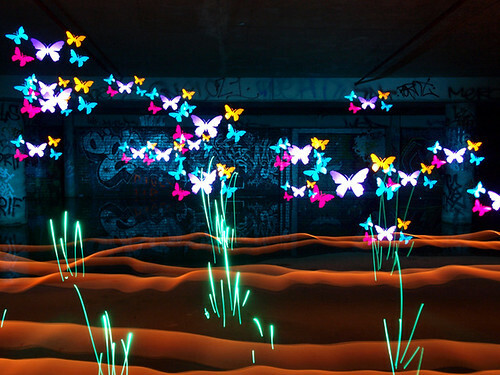 Just about any image can be used to make a light stencil. I have decided that I’m going to use a butterfly image, and I want the effect of many butterflies, so I draw up 2 different sizes to start. I prefer to draw the image onto paper, and then cut it out. This allows me to fine tune what I am creating before I spend the time cutting it out in cardboard, as I can hold this up to light to get a feel for how the end result will look with light behind it. However, you can draw directly onto the cardboard if you like, and skip this part. Now take a piece of cardboard and transfer the paper template onto it (or draw your design directly onto the cardboard). If you are using a shoebox, the design can be transferred directly onto the lid of the box. Leave a margin of no less than 3cm from the edge of the cardboard to the start of your design. This is what will attach to your lightbox, and this margin will assist in blocking light between the stencil and the box that you will attach it to. If you are drawing directly onto the shoebox lid then disregard this step. Using an art knife, take your time cutting the design from the cardboard. The key to a crisp design is ensuring that you have clean cut lines, so take your time on this part as it will pay off in the end. At this point spray paint the cardboard black, and use cloth tape to seal the edges of the stencil. It is painted black so that no part of it can appear in the final shot (if light were to hit it during shooting, this can appear as a light coloured blur within the shot). Now to add some colour to the butterflies. Cellophane is a good way to add colour, but you can play with all sorts of papers and textures to achieve different effects within your stencils. 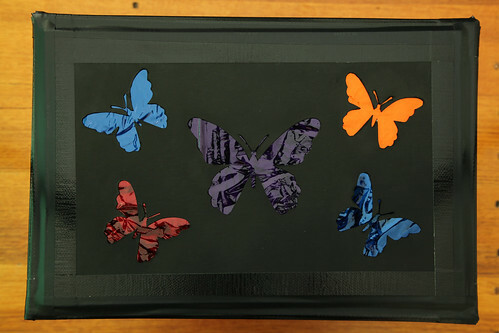 I have added multiple layers of the same colour of cellophane to each butterfly. Multiple layers allow me to achieve a richer colour. These are taped into place using invisible tape. 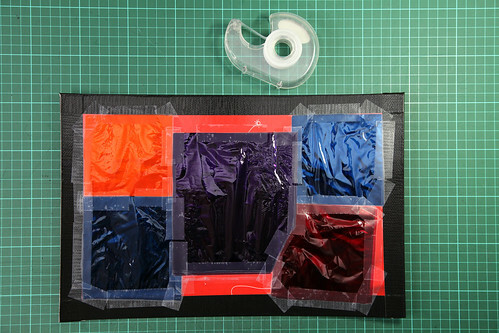 Lastly, behind the cellophane on the inside of the stencil, tape a piece of opaque paper. This gives the light something to bounce off to create your image. It is important to do a test shot prior to using your stencil, as this will allow you to correct any problem areas. You can see in the following image that there needed to be more layers of cellophane added, as the middle butterfly is overexposed. The key to imprinting the stencil image within your shot is containing the light, so that it highlights just your image, and it doesn’t contaminate the rest of your shot with excess light. Paint the outside of the box black. As mentioned above, this will prevent it from appearing in your final shot. 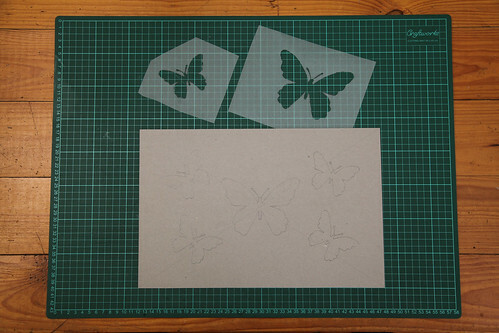 Cut a window on the front of your shoebox (allowing a 2cm border – this is smaller than the stencil to allow a crossover, which will prevent the light bleeding through between the box and the stencil). 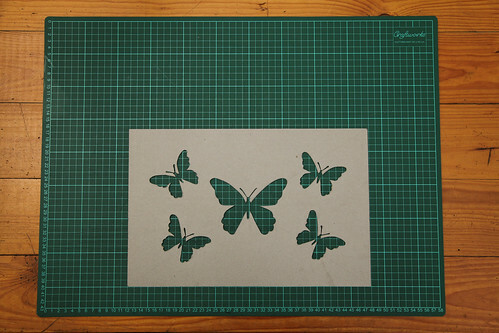 By cutting a border you can re-use the shoebox again with other stencil designs should you choose. Alternatively, you can cut your design directly out of the lid of the shoebox. Line the inside of the box with a reflective surface, and glue this into place (aluminium foil that is used for cooking works well for this). This will assist to evenly bounce the light. At the back or side of the box cut a hole for your light source to be inserted (this will be inserted from the outside into the closed box). I use a flash unit, as the quick flash produced captures a crisp image. Don’t make this opening too big, the aim is not to let light through here, as this may appear in your final shot. The box can be tailored further, by adding handle, or slots to insert and remove stencils quickly at the front. Now tape your stencil onto the open front window on the shoebox/lightbox, then insert a flash unit into the hole at the back/side, and you are ready to give it a go. Depending on the light sources being used, and the overall photo that you are trying to achieve, the aperture would be adjusted accordingly. A rule of thumb with any light art photography would be – the brighter the light source then a lower aperture would be used (eg f10-F18). For a straight stencil shot, an aperture around f7.0 – f9.0 works well. However, if you are using multiple light sources in your overall picture, you will need to adjust your aperture to accommodate all lights being used. ISO is mostly set to ISO100 for light painting, which assists with reducing noise during longer exposure. I use BULB mode (but you can achieve great shots at up to 30 secs, if that is all that your camera will allow). The camera is always mounted on a tripod, and remote is used to trigger the camera on/off (so that there is absolutely no movement). 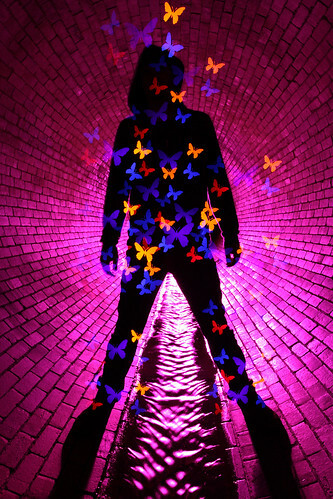 I have decided that I want to create a shot where it appears that the butterflies are coming out of the silhouette of a man. • I have the person stand in place, so that I can focus the camera to that focal length. • Camera is on BULB so that I have as long as I need to create the shot. • ISO 100 is used to reduce noise during a long exposure. • Aperture f13 is used for this particular shot, as I am using a bright light to light the surrounding area, and this can cancel out my stencil if I allow too much light in. – I stand behind to light the background, with the person standing in place it creates the silhouette at the same time. I am moving all through the shot, but you can’t see me because there is no light directly on me at any time. If I had light on me then I would appear as a blur. – I stamp the stencil image into the shot, by test firing my flash unit (which is the light source that I am using inside the lightbox). This stamps the stencil multiple times within that exposure to give the appearance of many butterflies. • Camera is turned off at 289 secs, to reveal the image.